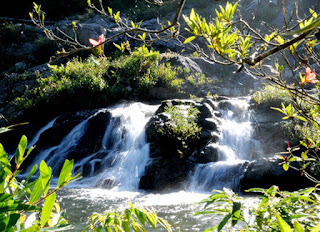 Remote Kon Tum province is the northernmost region of Vietnam’s Central Highlands. Despite good road access from the coast — (it can easily be reached within a day from Da Nang and Hoi An), it attracts few travellers, especially compared to the popular city of Da Lat. Travellers who do come usually breeze through for a night on Easy Rider-type motorcycle tours. This area is wonderfully unaffected by mass tourism and if you spend a little time here, you’ll be rewarded by stunning ethnic diversity, warm hospitality in remote Montagnard villages, beautiful rural scenery and a journey through Vietnam’s war-torn past. Kon Tum city sits on the bank of the Dakbla River, a great base for forays into the surrounding countryside and villages. Those arriving from a larger city will be shocked at the city’s quiet streets and easy-going pace. A motorbike ride outside of town, a coffee in the garden of Evacafe or a peaceful riverside beer will have you wondering, “Is this really Vietnam?” Blanketed by such tranquility, it’s hard to believe that Kon Tum was the site of an intense and bloody battle during the Vietnam War. By May 14, 1972, Kon Tum city was surrounded by the North Vietnamese Army. A month earlier the NVA had launched the Easter Offensive, throwing everything they had at key strategic areas including Kon Tum. In the days leading up to the Battle of Kon Tum, a flood of refugees flowed non-stop down Highway 14 into the city, mainly to escape American bombing, while Chinook helicopters carrying up to 70 people at a time made continuous flights evacuating as many as possible to Pleiku. The city swelled with 30,000 refugees, mostly Montagnards. The mood and evacuation was desperate; they knew what was coming. Three divisions of Communist NVA launched a day and night assault on Kon Tum as one South Vietnamese division defended it. During the 25-day siege, B-52s alone dropped 60 million pounds of bombs around Kon Tum. The South was able to hold the city but it was a Pyrrhic victory as both sides suffered staggering losses, not to mention the untold number of civilians who died. In just three months, from the start of the Easter Offensive to the end of June, out of a 200,000-man force the NVA nationwide suffered more than 100,000 casualties, an estimated 40,000 killed. A tour of the important battle sites is insightful but it’s not for everyone. The older generation in Kon Tum remember and lived the war – it was only four decades ago. The Montagnards especially suffered, caught between North and South and recruited by the Americans. Some 200,000 were killed, 85 percent of villages razed and to this day they face discrimination and suppression. 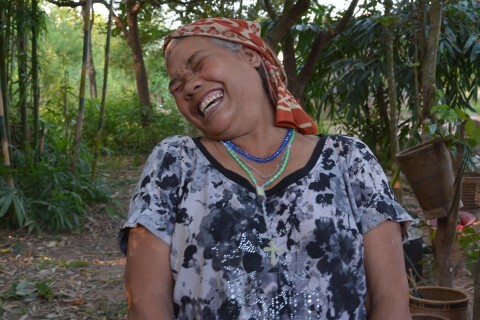 As one Montagnard man explained to us, they simply want the freedom to live their life. Today you’ll find joy and life in the province’s eight different ethnic minority groups: Sedang, Bahnar, Jarai, Jeh-Trieng, Brau, Kadong, Mnam and the smallest, Ro Mam, with only 200 remaining. This, by the way, doesn’t include numerous sub-groups, and many groups speak various dialects, too. As the modern world encroaches, the indigenous way of life, culture, traditions and language are disappearing fast and extinction is on the horizon. A few strongholds remain: some villages still require one or two days trekking to reach and they’ve had very few, if any, foreigners in their village. If you’re looking for off-the-beaten track Vietnam, this is it. A cheap tour would take you to villages with the iconic traditional Rong house right at the edge of town. They receive the lion’s share of tourists. When it comes to foreigners exploring independently, Kon Tum is far more relaxed about permissions than Buon Ma Thuot and Pleiku, where wandering around villages by yourself can land you in very hot water with the local authorities. Here you’ll be fine to walk around villages so long as you remain courteous with your camera and don’t go barging into homes without asking. It’s well worth the time and money to hire a good guide who speaks the ethnic group’s language to take you to villages further out. Ask lots of questions (definitely ask about the “love shacks”) and be prepared to make new friends over some jars of homemade wine. Arrange for an overnight stay (permits are required) to really immerse yourself. One of the smaller sights worth taking a look at is the Bahnar Catholic church on Nguyen Hue Street, a beautiful wooden structure built in 1913, designed by a French architect. It miraculously survived the war and one local recounted to us how 100 people hid in the cellars underneath the church for two weeks during an assault. In the end, other churches had been razed to the ground by napalm but this one remained intact. Stand outside during Mass to hear hymns sung in the Bahnar language. As a parishioner poetically explained, in our song “you’ll hear the sorrow of the Montagnards”. If you have free time, pop by the Catholic Seminary to see more fantastic French colonial architecture and the small hilltribe museum inside. One drawback to Kon Tum is that the hills surrounding the city are scarred by heavy deforestation. 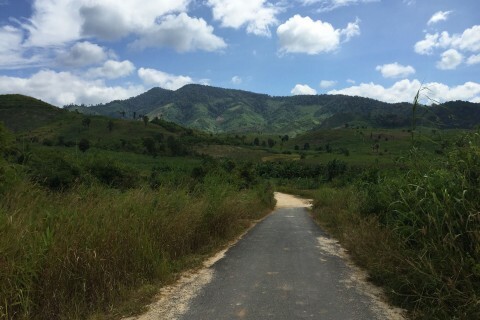 Rocket Ridge and other parts of the Ho Chi Minh Trail were affected by Agent Orange but the lack of vegetation elsewhere is due to logging and slash and burn agriculture. With their timber depleted, the Vietnamese now just pop across the border into Laos to fulfill their illegal logging needs. Kon Tum is situated along the northern edge of the Dakbla River.The riverside is underwhelming, and the only accommodation to take advantage of the river views is the Indochine Hotel. Reasonable hotels are found in or within walking distance of the centre, but Konklor Hotel does make an enticing case for staying outside of town. Free WiFi is standard. 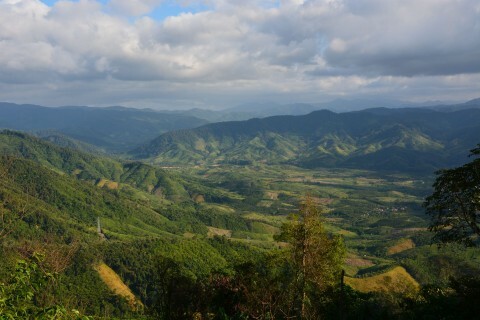 The Bo Y, Vietnam and Phou Keua, Laos border is 82 kilometres northwest of Kon Tum. This border will connect you with Attapeu and Pakse, Laos. A Lao visa on arrival is available to most foreigners. See Transport section for details. To reach the villages closest to town, take the river road Nguyen Hue east, past the wooden church, to its terminus at the Bahnar village of Kon Tum Khon Nam. You can also take Tran Hung Dao east to another village, Kon Tum Khon Pang. Two kilometres beyond that is the Kon Klor suspension bridge, locally known as the ‘love bridge’ as you’ll find teenage couples at night cuddling on motorcycles parked along the bridge. Beyond the bridge are more villages such as Khon Ka Tu, where many of the dance, music and wine drinking performances are hosted for the benefit of tour groups. Kon Tom has two seasons: dry season and rainy season (April to October). While the climate is not nearly as temperate as in Da Lat, travellers will find night time temperatures are pleasant year round. There are several ATMs with international networks scattered throughout the city centre. The maximum for foreign cards is 2,000,000 VND per withdrawal. There’s a Sacombank at 73A Phan Dinh Phung. The post office is located on the corner of Le Hong Phong and Ba Trieu Street, open daily from 07:00 to 11:00 and 13:00 to 17:00. Kon Tum General Hospital is located at 224 Ba Trieu Street, on the corner with Phan Dinh Phung Street. T: (060) 3862 573. If you’re travelling under your own steam and are determined to take the Ho Chi Minh Highway to Hoi An rather than the more scenic Route 24, you need not do it all in one hit. You should be able to at least find accommodation in the towns of Dak To (around 60km north of Kon Tum), Ngoc Hoi/Plei Kan (around 20km west of Dak To), Dak Glei (around 50km north of Ngoc Hoi), Phuoc Son (around 50km north of Dak Glei) and Hiep Duc (about 50km east of Phuoc Son and about 60 km southwest of Hoi An).